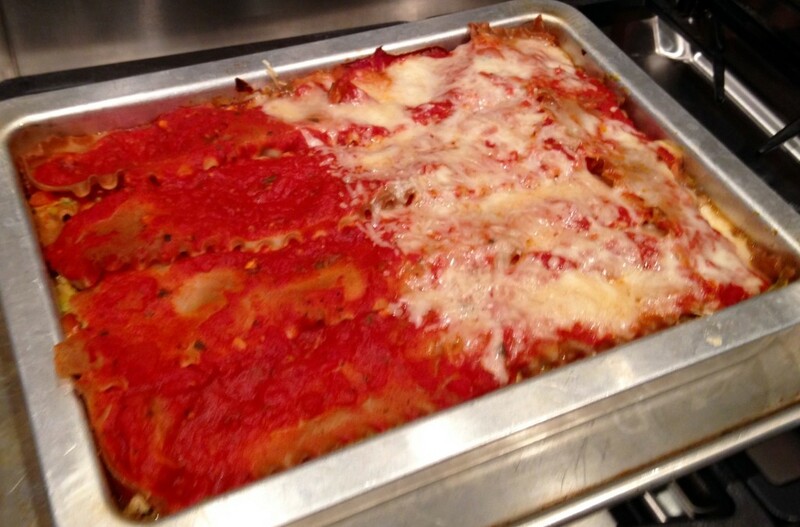 Let me first preface this post by saying that not everyone will like this lasagna. 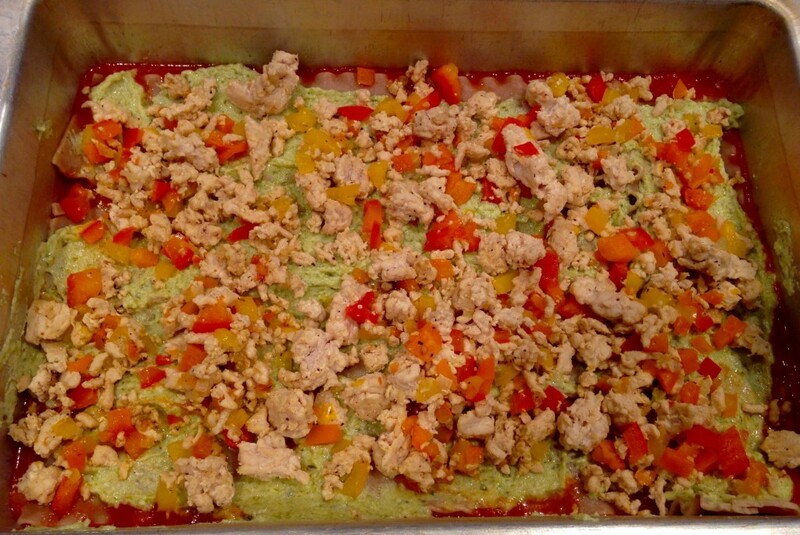 If you grew up like my husband and his family with down-home, butter-filled cooking, you definitely won’t like this healthy turkey lasagna, because for starters it has turkey instead of ground beef. Meat and potatoes people, you can just skip this post, and instead visit my one for traditional lasagna (also called The World’s Best Lasagna) here. HOWEVER, if you’re like my family and me, and don’t mind trying new foods or eating healthy, this is probably the healthiest lasagna you’ll ever make; and it doesn’t taste like cardboard. Yay! What makes it so healthy you ask? You ought to get an idea just by scrolling through the colorful pictures. 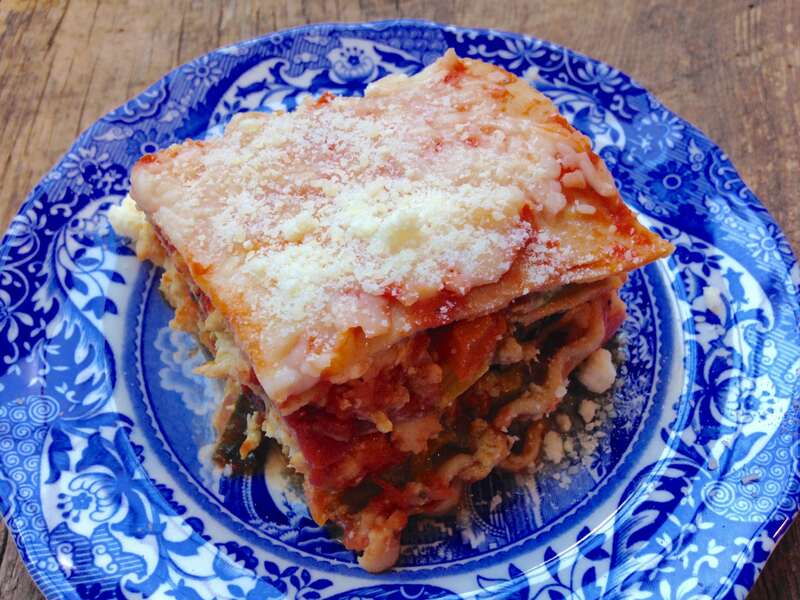 For one, whole wheat lasagna noodles are used instead of traditional white ones. Lean ground turkey is used instead of ground beef. There are THREE bell peppers – yellow, red, and orange – all of which pack the most nutrients and vitamin A. We also used basil and low fat ricotta cheese. Marinara sauce is already low it fat, and instead of mozzarella, this recipe uses Parmesan cheese. 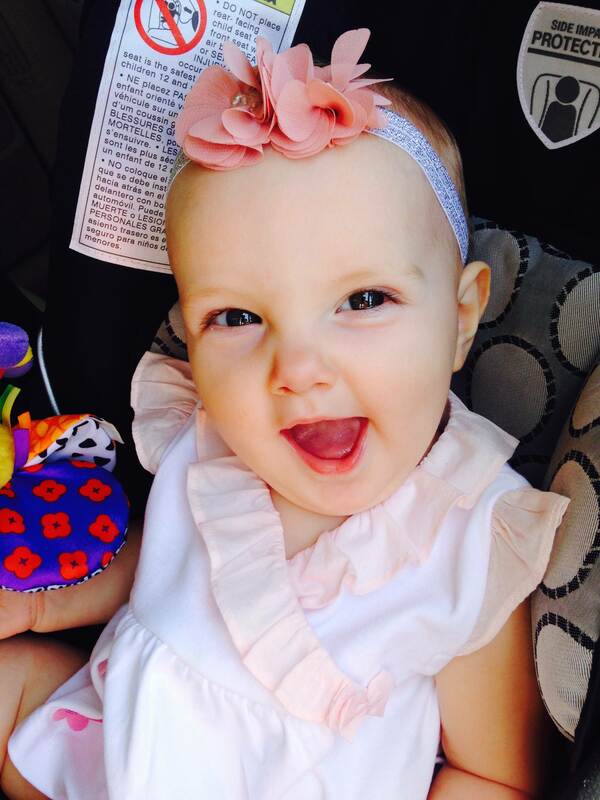 How can you not smile by looking at that sweet face? 🙂 Enjoy! 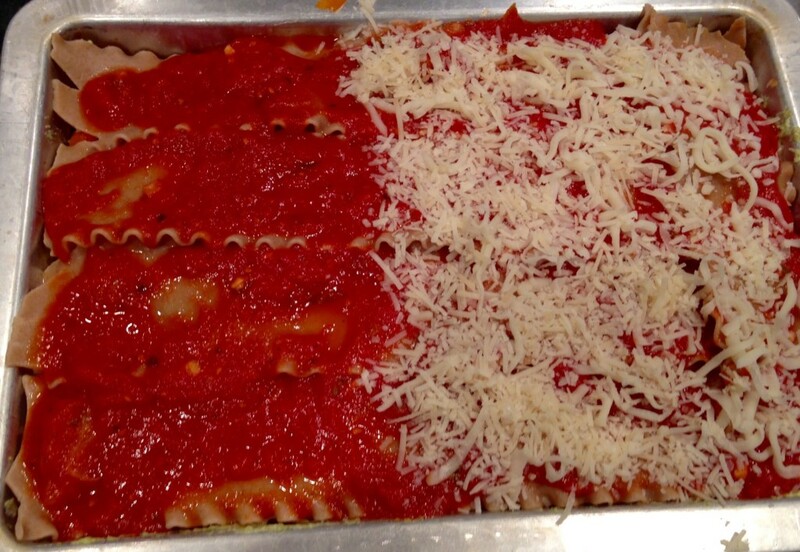 Prepare lasagna noodles per package instructions, rinse with cold water and lay in a single layer on kitchen towels. Heat 1 teaspoon olive oil in a large skillet set over medium heat. Add onion and cook, stirring occasionally, until onion begins to soften, about 4 minutes. Add garlic and red chile flakes, and cook for 1 minute. 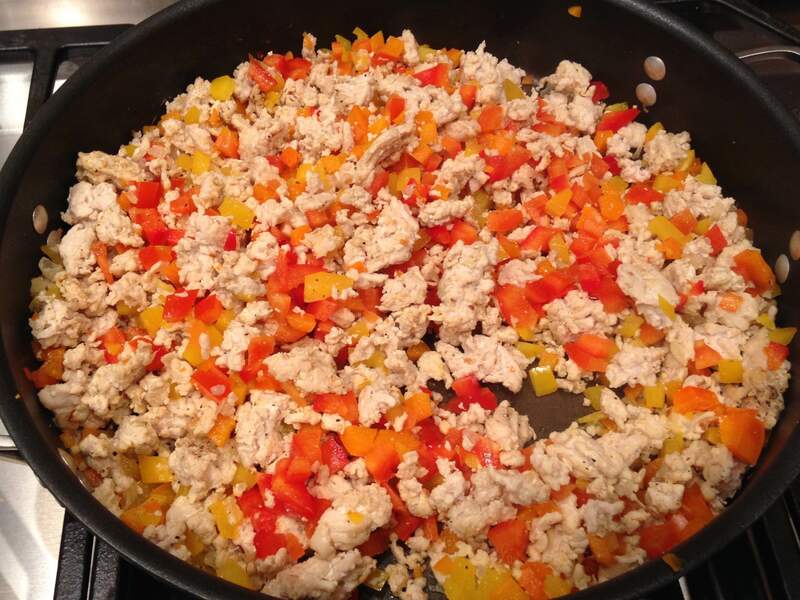 Turn the heat to medium-high and add ground turkey meat. Cook, breaking up the turkey meat with a wooden spoon. Season with salt and pepper. Pour off and discard juices. Transfer the onion/turkey meat mixture to a bowl and set aside. Warm 1 teaspoon olive oil to the same skillet, set over medium heat. Add diced bell peppers and cook until beginning to soften. Mix ricotta cheese and pesto. 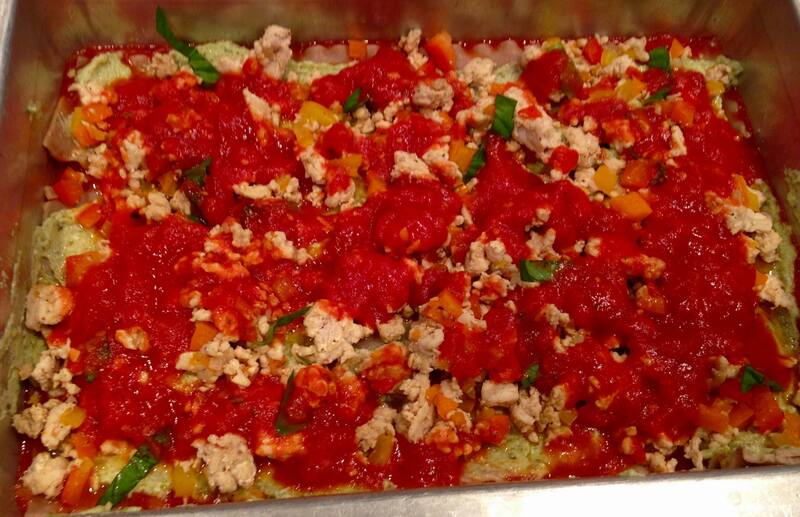 Spread 1 cup of the marinara sauce in the bottom of a 9x13-inch baking dish. 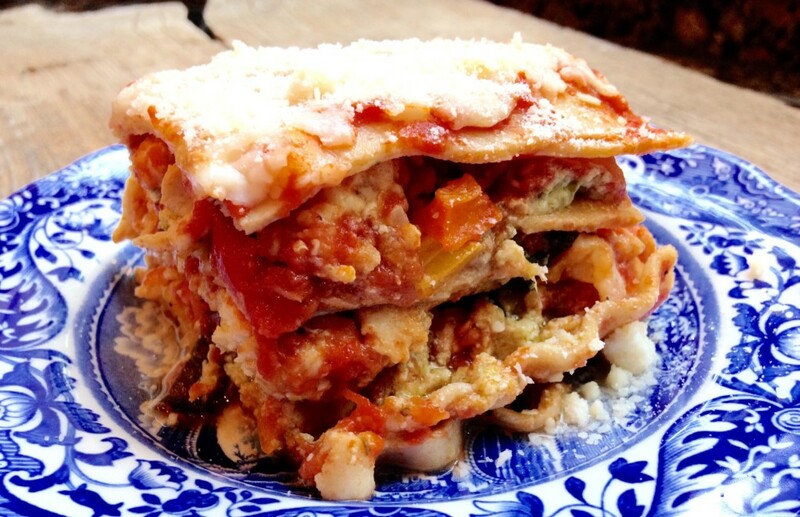 Lay a few lasagna noodles in a single layer, slightly overlapping, over top of the sauce. 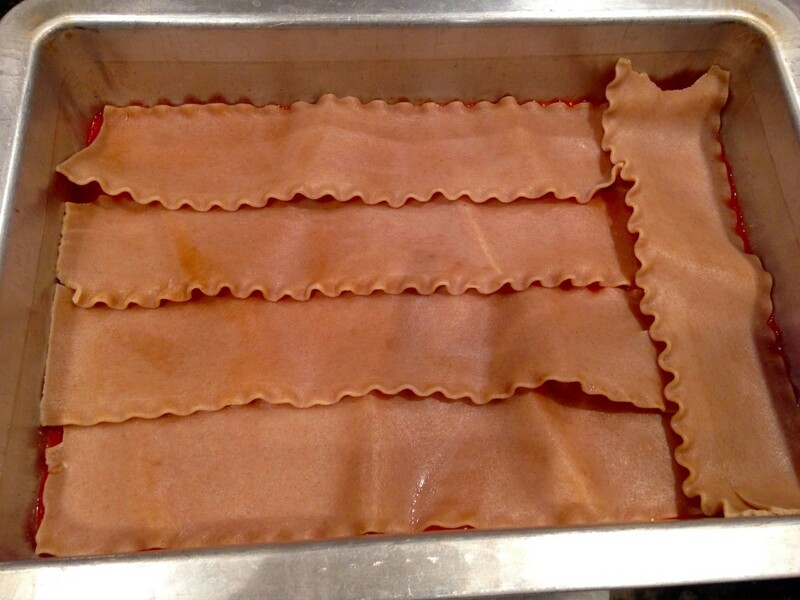 When fitting in the lasagna noodles, it may be necessary to cut some in half lengthwise or crosswise so that they fit properly. Spread ⅓ of the ricotta cheese mixture over the noodles. Top with ⅓ of the turkey mixture, ⅓ of the pepper mixture, ⅓ of the sliced basil, and additional 1 cup of marinara sauce and ¼ of the Parmesan cheese. Repeat these layers 2 more times, starting with the lasagna noodles. End with an additional layer of lasagna noodles and the remaining marinara sauce and Parmesan cheese. Cover with foil and cook until the lasagna is bubbling, 55 to 60 minutes. Remove the foil and bake for an additional 10 minutes, or until the cheese on top is melted and just beginning to brown. Let rest for 10 minutes, cut into squares and serve.